Chris Downing launched his Spirited 380 named 'Tasha' last week on Friday the 20th of March. The project took just over 6 years part time with a stunning result. The finish is as good as a professional standard with a very high attention to detail and choice of fittings. Internally the finish is mostly satin polyurethane paint surfaces with some soft linings. The interior design was customized with a separate walk-in basin area forward of the main head & shower. This has made space in the saloon for instrumentation and a neat hide-away locker for the TV. Another change was in the Starboard aft cabin which was made into a walk-in workshop area with provision for his bicycle with also the option of a fold-down bunk. Chris has put a lot of thought into making good use of space with large slide-out drawers in the galley and also below the saloon seats. 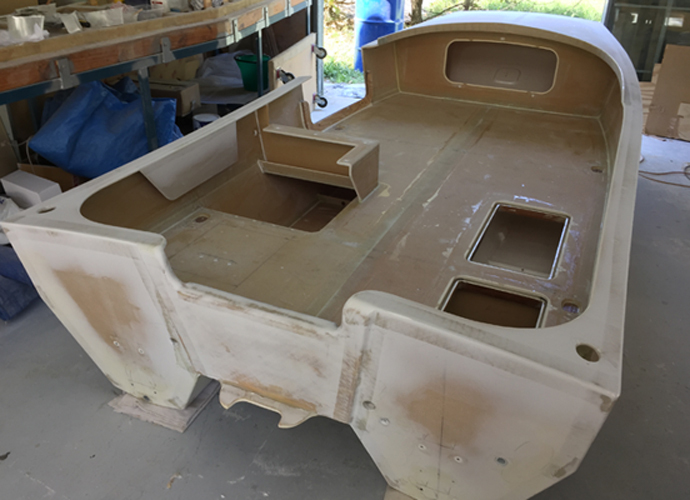 Another choice was to fit two drop-down windows in the aft saloon bulkhead which opens up this flow-through area substantially together with the main door. We were lucky enough to be present for the launching which went very smoothly with an almost perfect venue for this event. The trucking and crane company should be commended for their faultless service. Congratulations to Chris and all who helped him on a fabulous achievement! 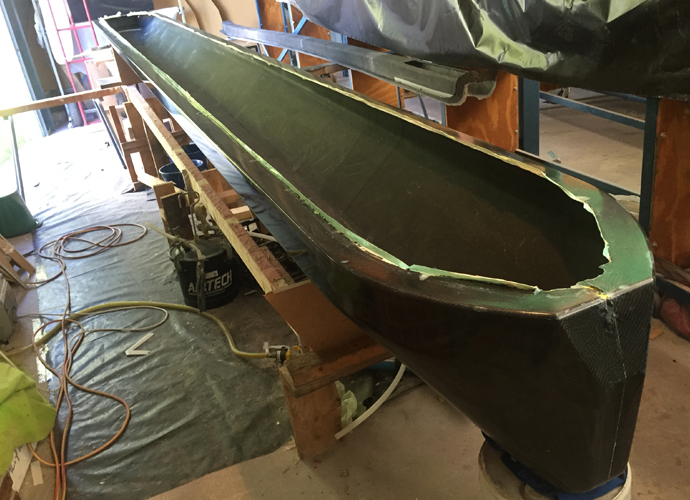 Chris is awaiting the delivery of his carbon fiber rig and sails so we hope to see 'Tasha' sailing in the coming weeks. 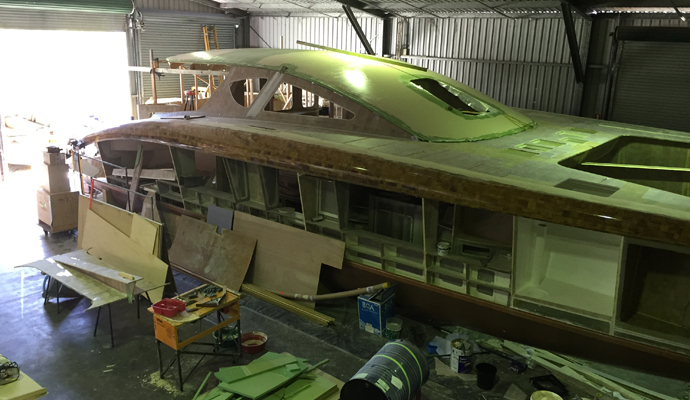 Hoult Spirited 480 getting close! 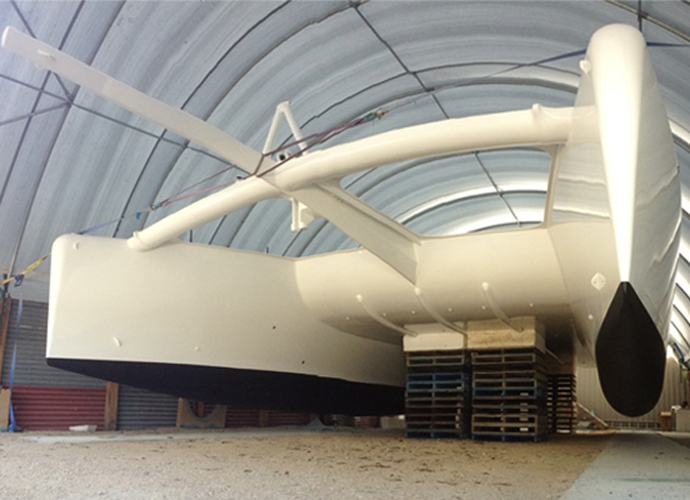 This creative shot of the Spirited 480 in Tasmania shows the boat suspended by the bridgedeck with hulls antifouled. We will keep you informed as the countdown continues!